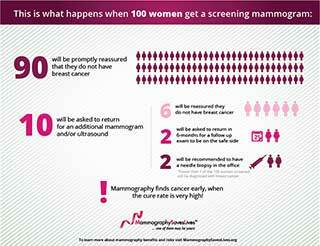 Understanding Your Mammogram (English) 102315 from U2MediaGroup on Vimeo. For every 1,000 women who have a screening mammogram, 10 percent will be called back for another look, according to the American College of Radiology. Sylvester focus groups determined that while screening recipients understood the importance of following up, they became anxious at doing so. The focus groups, comprised of 25 women, indicated that testimonials would be most effective at relaying the message that breast density is not something to fear. Wilette Whitfield-Smith is among the five women who provided testimonials in the video’s English-language version.She wanted to participate, she said, because informing others made her feel empowered. “If I could do anything to … ease the fear of a woman not only having a mammogram, but knowing what more specific questions to ask before, during and after, I wanted to do my part,” Whitfield-Smith said in an email. Both videos are narrated by Sylvester radiologist Dr. Monica Yepes, who, as a native Spanish-speaker, wrote the script for the video’s Spanish-language version, which features two women. Luz Ballesteros is one of them. Ballesteros, 50, said she wanted to help inform other Hispanic women who may not be familiar with breast density. She also wanted to embolden Hispanic women to be proactive about their breast health. Marcus said the video will be available as an educational resource for anyone who wants it.